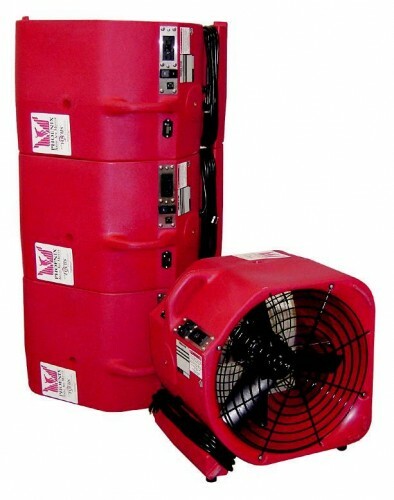 If you are in need of portable fans there are many different styles, makes, models, and manufacturers of these air moving devices on the market today. There may be certain options that interest you most and so you will need to do a little thinking before you go out and look for a unit that will work for you. 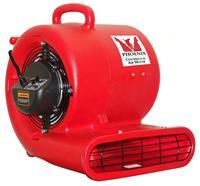 Below are a few suggestions of things to look for when thinking about buying portable fans. Some of these things you may have thought of and some of them you may not have known even existed on an air mover. First and probably most important is to determine how much cfm of air you need to move to accomplish what your task. Then look at the amount of amp draw per unit and make sure the area they will be used in can support the amp draw. These are the two main factors when purchasing portable fans. After that there are a few options that may make your choice easier to use and give you more flexibility in what you can do with the unit. The option I like the most is daisy chain capability. This is where the portable fan will have a GFCI electrical outlet on it comes in handy. This way you can plug in other pieces of equipment to it. When used this option will cut down on the need for extension cords, which can be trip hazards. Also, having a circuit breaker on your air mover is a big plus. That way you would blow the circuit breaker before blowing the electrical breaker to the building. Next a plastic housing for portable fans helps lighten the load. Having an air mover with a plastic housing may not seem like a big deal but it can be if you are the one always moving them around. Along this same line an ergonomically designed and balanced unit will help you when you are carrying these around. There is nothing worse than carrying something that is going to hit your legs all the time or be clumsy to move around. Also, the plastic housing makes cleaning easy. When the unit gets dirty the plastic housing can be cleaned up with a rag and some water. A good tip for keeping these plastic housings looking good is to use your favorite tire shine product on the housing. This can actually help hide small scratches and keep the equipment looking great from job to job. Then obviously you want to look at the warranty of the unit before purchasing. Warranties will vary from manufacture to manufacture and so make sure you are aware of the specifics of the one you are interested in. So once you have done all your research on which features you are interested in then it is time to go buy your portable fans and put them to good use. With a little planning and forethought, these units should give you years of dependable service without the nagging feeling of wishing you would have bought the one with the extra options. This article was published on Tuesday 19 March, 2013.